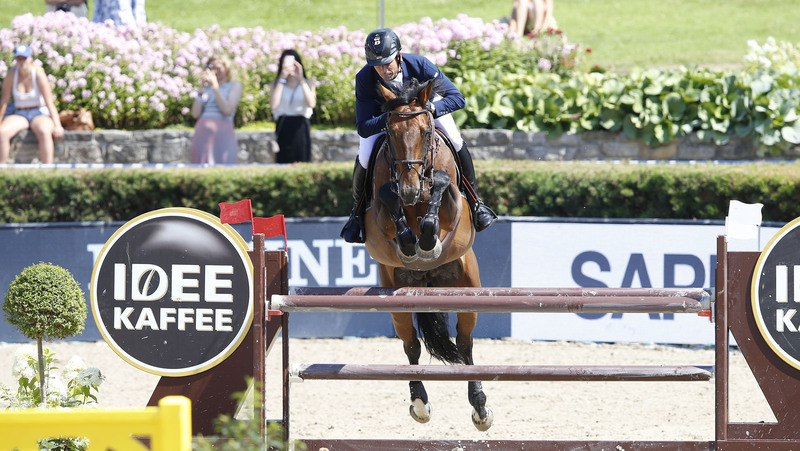 Notorious speed merchant Julien Epaillard (FRA) and Safari d Auge flew to a breath-taking win in the CSI5* IDEE Kaffee Preis today, with local spectators delighted as home riders Felix Hassmann (GER) and Holger Wulschner (GER) took second and third. The final day of competition at the Longines Global Champions Tour of Berlin kicked off with a fast and thrilling 1.45m speed class, with fans once more packing the Sommergarten to watch many of the world’s top horse and rider combinations take centre stage in the penultimate class of the weekend. The course set by Frank Rothenberger was tough enough, with a few daring options and plenty for the riders to think about if they wanted to take a chance of the win. Plenty put their foot to the floor but poles fell time and time again, the lightest of touches ruling them out of contention. One of the first to jump cleanly Eduardo Álvarez Aznar (ESP) picked up a time fault with Seringat, however the Spanish rider clearly had a different game plan, opting for a quiet clear but it would mean he finished high up on the scoreboard today. First to jump cleanly and well within the time, much to the delight of the local crowd, was home rider Felix Hassmann (GER) and Balzaci who absolutely blazed around the arena to set a time to beat of 52.55s - an impressive time and competitive to say the least. Christian Kukuk (GER) and the huge grey Botaro, only an eight year old but looking a potential star of the future. The pair opted for a slower clear, stopping the clock in 62.32s, but enough to put them in provisional second behind his compatriot Hassmann. “He’s a young horse, the youngest here today so my plan was always to have a nice clear round. There are not so many clears and he did very well so I think the plan was good for us today!" Flying Frenchman Julien Epaillard (FRA) pulled out all the stops with the 12 year old Safari d Auge to power to the top of the leaderboard. Taking an incredible angle to the 10th fence, a delicate vertical, the horse delivered, trusting in Epaillard and the pair flew through the finish in 49.91s - the first sub 50s time of the day. Others would try, but couldn’t match his time - Mark McAuley (IRL) jumping clear with Jacintha vh Kriekenhof in 58.51s, Pius Schwizer (SUI) with Living The Dream in 63.60s and Holger Wulschner (GER) with Zuckersuess d’Argilla with a strong time of 55.69s. Yesterday’s Longines Global Champions Tour Grand Prix of Berlin presented by Sapinda winner Alberto Zorzi (ITA) also jumped clear with the nine year old Viceversa de la Roque, picking up just a single time fault as he built for the future with the young horse. So it would be a win for Epaillard, taking the lions share of the €25.000 prize purse, with Hassmann and Wulschner taking second and third, much to the delight of the local spectators.